There’s no better way to spend your first day in a new city than by foot. Lucky for James and I, Thoughtworker Tim Cochran was familiar with our current city of Porto Alegre and offered to show a small group of us around via a walking tour. The public market in Porto Alegre, Brazil. We met at Mercado Publico Central around 1:30 for lunch. This massive public market opened in 1869 and boasts over 110 outlets ranging from meat markets to restaurants. It’s obvious that this is the heart of downtown Porto Alegre. Everything seems to branch out from this historic area. Enjoying lunch at the public market in Porto Alegre, Brazil. We enjoyed a lunch upstairs at Taberna 32 as shoppers hustled about their business. 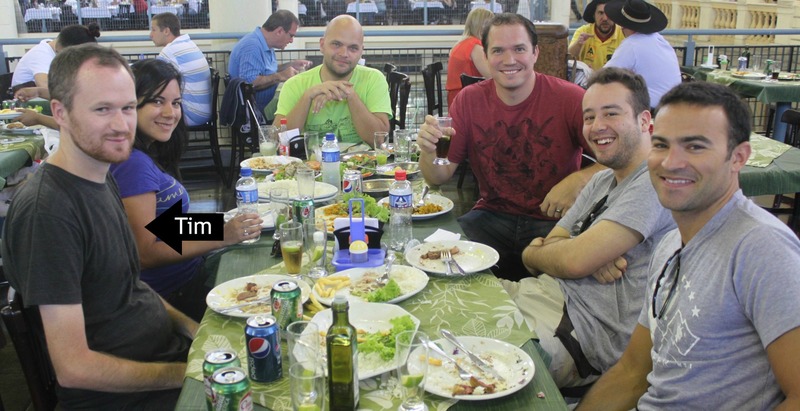 Here you will find a variety of meat, lamb and seafood usually accompanied by rice and salad. If you’re in a hurry you may want to grab a quick pastel from one of the many vendors as the service here was very slow. From the market we headed west towards Praça da Alfândega (Customs Square) which is surrounded by several attractions. One being the Santander Cultural Museum now featuring the photography of Brazilian artist Miguel rio Branco in an installment titled “Blind Spot”. Here you can admire the art as well as the architecture of this magnificent building with its giant columns and stained glass ceiling. 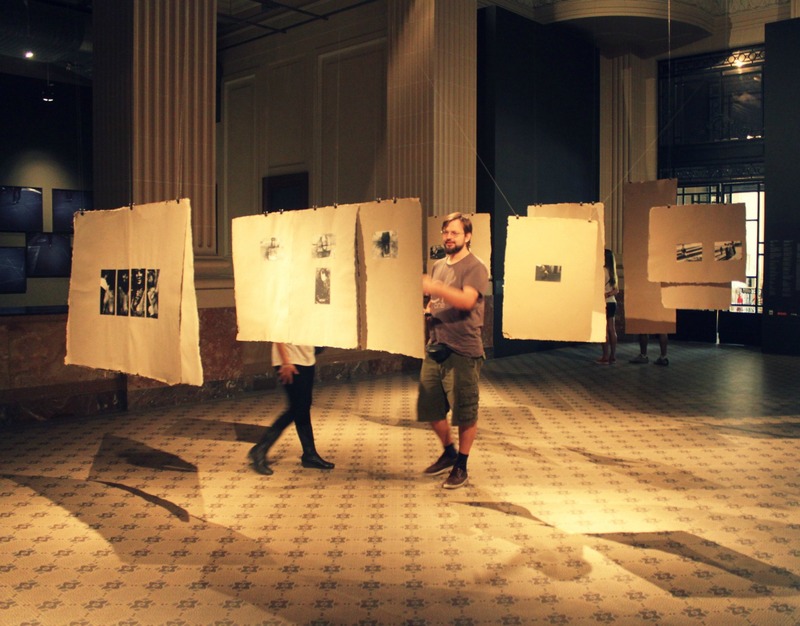 Guests enjoy the work of artist Miguel Rio Branco at the Santander Cultural Museum in Porto Alegre, Brazil. Nearby is the Memorial do Rio Grande Sul which chronicles the history of Porto Alegre. Everything is in Portuguese so you may not learn much but it’s worth popping in for a look inside this historic building. Next store is the Museau do Arte do Grande do Sul. This modern gallery has several floors featuring a variety of artwork. The most interesting for me was the collection of homemade weapons confiscated from prisoners as early as 2002. Helpful hint, don’t end up in a Brazilian prison if your weapon making skills are sub par. You’ll be at a disadvantage for sure. 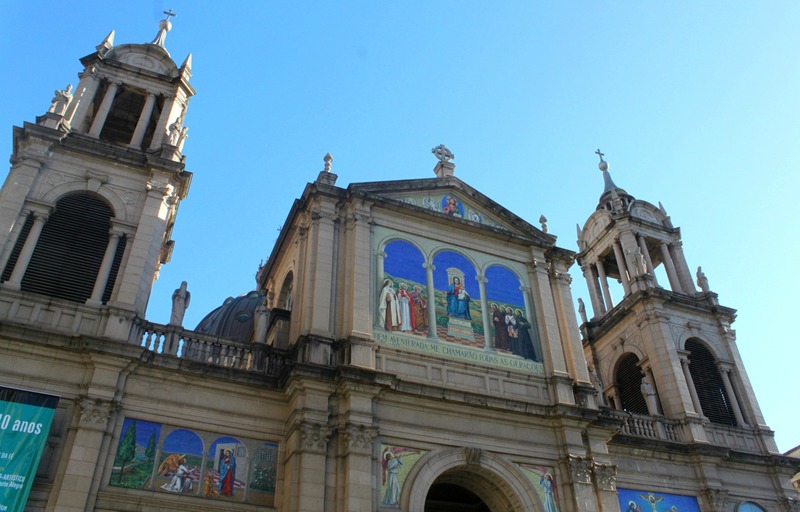 For a more peaceful experience we checked out the Metropolitan Cathedral of Porto Alegre. Erected by Pope Pius IX on May 7, 1848 this classic church has a simplistic beauty about it and offers a peaceful place to retreat from the outside world. The Metropolitan Cathedral of Porto Alegre. We briefly ducked into Casa de Cultura Mario Quintana. 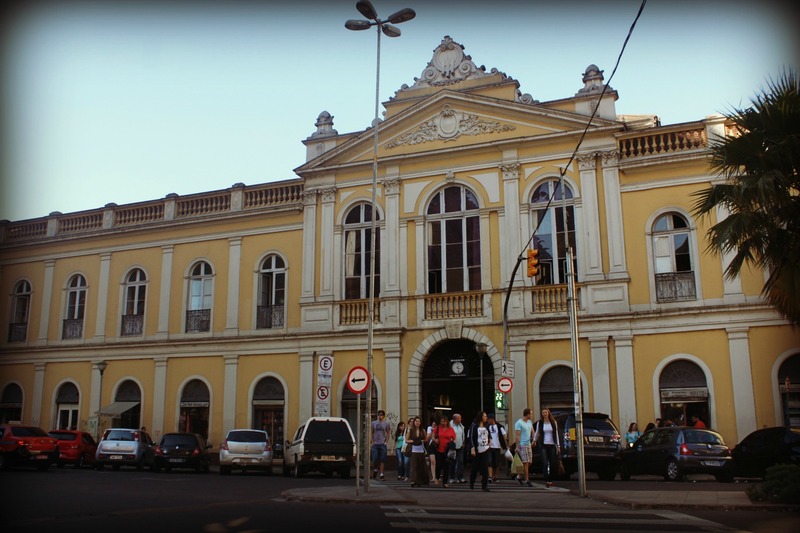 This cultural center was once a popular hotel and is named after Mário Quintana, one of tBrazil’s greatest poets who lived there between 1968 and 1982. The building now houses theaters, bookstores and exhibits. Café Santo de Casa is located on the top floor and has a terrace overlooking Guaiba River, our final destination. On our way to the river we passed by Igreja Nossa Senhora das Dores (Our Lady of Sorrows Church). With its origins dating back to 1807 this is the oldest existing church in the city. 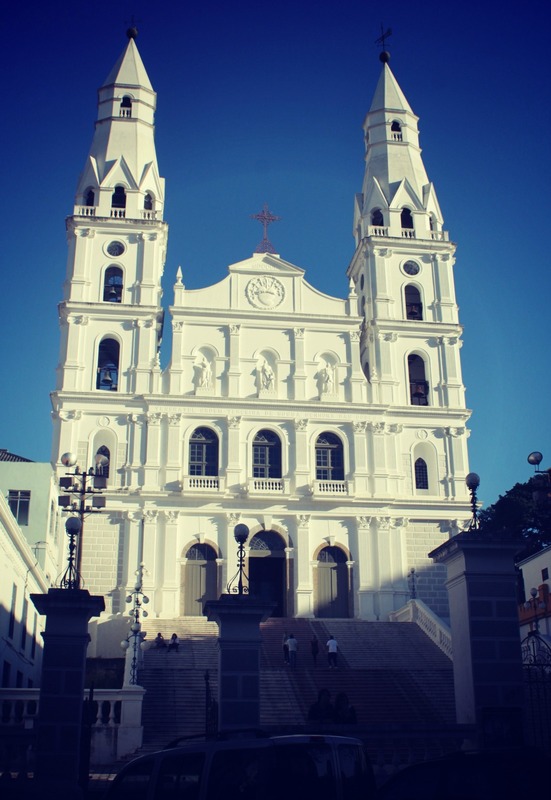 With its massive staircase leading to an ornate, stark white facade this church is a must see. The oldest existing church in Porto Alegre, Brazil. Our walking tour ended on the banks of the Guaiba River where we settled in to witness the sunset near Usina do Gasômetro, an old power plant built in 1928 which now hosts movie theaters and art expositions. This is a popular place to see the sun go down. As vendors sell popcorn and churros, hundreds nestle along the rivers edge to see the sun dip below the brush. Resting and waiting for the sun to set. Tim’s walking tour was a great way to get a feel for this new city. Perhaps the best part was that everything was free. Aside from our lunch, we didn’t pay a dime yet learned so much about this southern city. Thanks Tim! 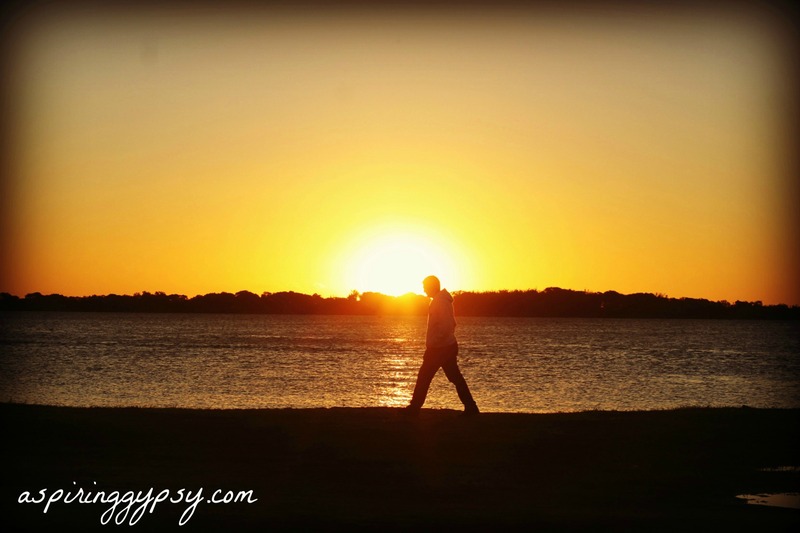 The famous sunset along the Guaiba River in Porto Alegre, Brazil.